TEXAS: Evacuations Underway As Harvey Intensifies - Joe.My.God. 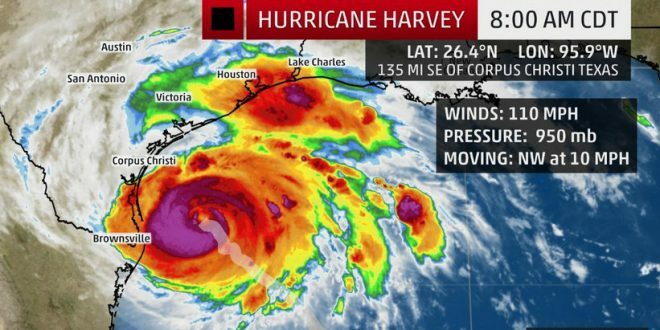 The National Hurricane Center warns that conditions are deteriorating as Hurricane Harvey strengthens and slowly moves toward the Texas coast. The center says preparations for the storm “should be rushed to completion” Friday morning along Texas’ central Gulf Coast. The center says the storm has maximum sustained winds of 110 mph (177 kph), just shy of the benchmark for a Category 3 storm. Forecasters say the storm is expected to reach that mark before making landfall late Friday or early Saturday. Millions of people are bracing for a prolonged battering that could swamp dozens of counties more than 100 miles inland. The threat of Harvey became evident Thursday when several counties on the Texas coast issued evacuation orders — and an exodus of residents began. Drivers sat bumper-to-bumper, with highways backed up for miles. Rose Yepez told CNN it took her twice as long as usual to drive 140 miles from Corpus Christi to San Antonio, en route to Texas Hill Country. Private vehicles — along with city buses packed with adults and children carrying backpacks — jammed roads for hours.